THE LAST SPIDER-MAN STORY Not even The Amazing Spider-Man is safe from Secret Wars! 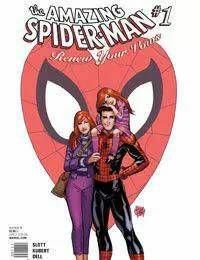 In this new Marvel Universe, Peter Parker, Mary Jane Watson and their daughter have to scrape by to make ends meet, but they have each other… Face front, True Believers. This is the one you've been asking for.